I belong to some Ehlers-Danlos Syndrome groups on Facebook, and they can be a fantastic resource for information. I wouldn’t know half as much about this complex condition if I didn’t have that connection to others living with it. Today I found out just how powerful groups such as these can be. It started when a member posted a video of a lady on YouTube called “My Naked Protest.” In the video a lady called Kateryna sits in her chair, naked – and explains that she has been left without care for about a month – and cannot look after herself. She is now covered in pressure sores and rashes, and doesn’t have any pain medication for her Ehlers-Danlos Syndrome. (She also has brain injuries, Autism and spinal cord injuries.) She has not been able to bathe for a month, and the last caregiver she had washed her clothes in detergent she’s highly allergic to – making her even more ill, which is why she sits there naked. She’s also now having to try and rehome her two cats – one of which is a service animal, as she can’t take care of their medical issues. Making her bed is also impossible, and the sheets are causing her agony without the right pressure relief pads on it. She explains why she has lipstick on – knowing already that people would judge her for such a thing. She had put it on a few days previously to make herself feel better, but then the carers had failed to show up as promised, so she’d been unable to wash it off. And so – after being totally abandoned by the care agencies, and after phoning constantly asking for help, and being told over and over that they’ll be there tomorrow – she makes one last desperate attempt to get help. When you have to take your clothes off to get help, something has gone horribly wrong. The video was published on the 8th January, so she still had a wait – but when the video was posted in an EDS group, a few people jumped into action. Members called to report the problems to Adult Protective Services. Others called the police. The police visited her – and were appalled by her situation, and made their own report to Adult Protective Services. They brought food for her, food for the cats and toilet paper, and even made her bed. Someone asked a local pizza shop to donate a meal – which they did, along with some large bottles of water. Her medical insurance company saw the video and have arranged for alternative care from tomorrow. What’s terrifying is that this situation is repeated across the world. So many people with disabilities are hidden away, suffering without carers in place – struggling just to get by. While this is an awful story – the silver lining was that it was lovely to people pulling together to get help in place so quickly and I hope the next care company don’t let her down again so badly. Kateryna would like her story to be passed around so others do not suffer as she has. I hope she has a happy ending. When you’re in constant pain, it’s very easy to focus on it. It can become all-consuming, and the more you think about it – the worse it feels. Someone once suggested to me that I try crafting as a means of distraction. I have to be honest, I was a little annoyed – how would painting a pretty picture take my crippling pain away? It seemed a little dismissive. Plus there was also the fact I’d never thought of myself as a particularly creative or artistic person. At school even my doodled stick figures ran screaming in terror, and my art teacher made it clear it wasn’t my forte, but I thought I’d give card-making a try. I enjoyed making them, but they weren’t that great. I’d look online at all the beautiful designs people were creating, and it just didn’t feel quite like me. After I’d spent a fortune on card-making supplies, I decided to try my hand at jewellery instead, and in doing so found a new passion. The early days of making jewellery weren’t easy – my hands cramped up terribly, and I was left with blisters all over my skin. In time my dexterity improved and it helped strengthen some of my muscles in my hands. And it was true – when I’m busy concentrating on making a new item, my brain is focused elsewhere. It doesn’t make the pain go away, it just redirects my attention so I’m not thinking about it, which is really helpful. Once I joined the world of crafting – I found more and more other people with disabilities were also there, and finding an outlet in art – by painting, woodwork, ceramics, photography or anything in-between. For example a friend of mine makes ‘pain monsters’ from felt when she’s having a bad day, which helps her create a visual representation of what she’s feeling. It took me quite a long time to find out what was wrong with me. Many years of fighting and pleading with the medical community to stop shrugging their shoulders, and to do something. When I was told I had Fibromyalgia, it came as something of a relief. I felt like I wasn’t alone – there were other people with this stupidly long list of symptoms out there. I wanted to commemorate the end of that fight, that also informed people about the condition. I made my first Fibromyalgia awareness bracelet not long after, and then began to receive requests to create ones for other conditions – including some I’d never heard of before. People liked the more personalised feel to the more generic rubber bands that are usually sold. My biggest seller was for Marie Charcot Tooth Disease, and eventually the national charity began to order from me so they could sell them on their website. I also auctioned lots of my bracelets off for the Fibromyalgia Association UK, and also for Ehlers-Danlos Syndrome related charities when I was diagnosed, a genetic multi-systemic connective tissue disorder. It made me feel like I was helping, even in one tiny way. It’s very common to walk into a shop and see a row of pink coloured items for Breast Cancer awareness. Yet there are so many other conditions that people often haven’t even heard of before, let alone understand what they entail and what it’s like to live with them. People have often told me when wearing one of my awareness bracelets it has sparked conversations with friends and family who had never asked about their health before. The colours of the bracelets are usually picked by the existing awareness ribbon colour, and if there isn’t one, then by the colours of the national organisation/charity for the condition. Sometimes there are obvious symbols that can be included as charms. Fibromyalgia often has an association with butterflies, Autism with jigsaw pieces, Charcot Marie Tooth Disease with hands and feet. Sometimes a spoon charm is added from the fantastic analogy “The Spoon Theory” by Christine Miserandino, to which many people with chronic illness resonated with. My most commonly used charm is simply a silver ribbon with the word hope written on it – as I believe that’s something we all need in some form or another. In April this year I had to stop working due to my health continuing to get worse. Being able to make jewellery – even if it’s for twenty minutes in the middle of the night when I’m struggling to sleep, has helped keep my spirits up and creativity flowing. If you’re interested in seeing more of my jewellery and awareness items you can find me under Sparkly Place Jewellery on Facebook. What do you think of ME? That condition people have when they don’t want to work? Yuppie flu? We are all tired – so stop whinging? The medical community and the media has portrayed a certain image of ME that doesn’t live up to reality. Did you know ME is actually a neurological condition similar to MS? That people regularly die from it? Some years ago the condition was renamed in some circles as ‘Chronic Fatigue Syndrome’ and pedaled as a mental illness – which couldn’t be further from the truth. Many activists are now trying to divorce the two conditions. Chronic Fatigue seems to be a catch-all for long-term fatigue to which no other cause can be found, yet ME is testable, and so much more than fatigue. I don’t normally link to The Mail, and in some ways I find this article funny, as they probably wrote 90% of the articles calling people with ME lazy, job-shy malingerers, but it’s a good look at the myths of ME. The Spoon Theory was written some years ago by Christine Miserandino in regards to a conversation she’d had with her friend to try to explain what it’s like to live with a chronic illness and it’s an excellent read I like to share with people. Her friend asked her what it was like living with Lupus every day. Christine picked up a handful of spoons, and gave them to her friend, declaring she now had Lupus, and this was her allowance of spoons for the day. A normal, healthy person has limitless spoons and can pretty much do what they want, but someone unwell wakes with a limit of spoons and has to carefully ‘spend’ them and compromise on which task they need to do. Each spoon represents a task needed to get through the day i.e. a shower, getting dressed, making lunch. Each task costs her a spoon. When the spoons run out, that’s it. She can’t do anything else. up with less spoons than other days, and sometimes she can rest the day before and save a few more up. Sometimes she goes into minus spoons and it causes a massive problem. Sometimes you have an event you have to go to and it will cost you an enormous amount of spoons, but you don’t really have a choice (such as a family wedding). Those with chronic illnesses often call themselves ‘Spoonies’ because of this. It’s very hard to understand what it’s like living like this each day and really no one can until you’ve walked in their shoes, but it’s an excellent analogy that hopefully everyone can picture. You can read The Spoon Theory here. Karen Lee Richards has written the top then things never to say to someone with Fibromyalgia here. Her list, my thoughts. She has more at the link. 10. We all get more aches and pains as we get older. My pain started when I was about 10, and hasn’t stopped since I was 15. I’m not old. It’s so much more than aches and pains. An old lady shivered the other day and said she felt the cold. I agreed I did too. She glared telling me to wait until I was older. Right. 9. I think I have that, too – I’m always tired. It’s not just tiredness. It’s crippling fatigue. I’m lucky in that generally I have a lot more of the pain than the fatigue, and I do take a lot of steps to try and pace myself. The second I don’t – I’m screwed up for days. It’s bone aching exhaustion and there’s nothing you can do about it. 8. My friend has fibromyalgia and still manages to work. Maybe you just need a job (hobby, etc.) to take your mind off the pain. I am currently working three days a week. I work a day, have a day off. I’m off sick a lot, and am struggling my arse off to carry on, because I just can’t afford not to work. It doesn’t mean I’m not bad, I just feel at the moment, I don’t really have a choice. 7. 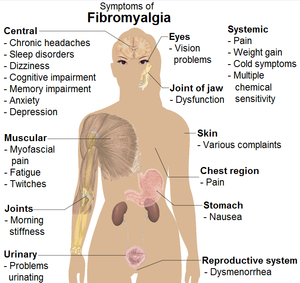 My doctor says fibromyalgia isn’t a real disease; it’s just a wastebasket diagnosis. Utter rubbish. Sadly a lot of doctors don’t keep up with the research, and still see it as ‘I don’t what else you’ve got so I’ll say you have fibro.’ There is lots of evidence it exists. At consultant at the local hospital said I had it, but refused to officially diagnose me as it was too “American.” If by that he means they take it a bit more seriously, then sure. But the illness is real and debilitating as any other, and has no nationality. 6. If you got more sleep, you’d feel better. I do sleep. I can sleep up to 16 hours sometimes, but other times struggle to sleep four. But no matter how many hours I wake up exhausted, because people with Fibromyalgia do not reach the ‘deep sleep’ stage, the restorative and healing stage. So the problem is our sleep has no quality to it, it doesn’t really matter how much you get. 5. I read about this new product that cures fibromyalgia. Yeah? How much does it cost? It’s amazing how many new products come out that totally cure x y and x, but whoops, it costs £1000+. I’ve heard so, so many therapists tell me they can cure me and then not make the slightest bit of difference. If a product genuinely works, I find most people want it to reach as many people as possible at a cost they can afford. Generally. 4. At least it’s not fatal. But it has changed my life. It took away my ability to walk, to fully enjoy socialising, to work how I wish. Sometimes during my worst days I do wish it was fatal because it’s hard not to when you’re constantly exhausted and in agonising pain. I believe conditions like this should be taken just as seriously as fatal ones, because they truly impact every facet of your life and if it was taken seriously hopefully more resources could be put into research. 2. But you don’t look sick. That’s because you don’t see me when I wake up almost screaming in pain because some joint is out of place. You can’t see pain visually, but you can if you pay attention. Yeah, something probably has gone wrong in our head like our brain is recognising pain signals far too much, but it’s totally and utterly real.